Update: Stranger #9 got in touch through Flickr mail. She’s Joelle. Thanks for getting in touch Joelle – I’m really pleased you like your pictures, and have sent them to your gmail. Enjoy! Massive thank you for taking part in the project. So, just nine shots into the 100 and I have broken one of the rules I made myself and forgot to ask a stranger’s name. I did share my Moo card with the fantastic girl in the shot above, so if you’re her and are reading this – I’m sorry! Please drop me a note so I can correct it! I saw her sitting on the pavement with a friend, and really liked the bold look and spectacles. I explained the 100 Strangers Project, and she was happy to join in. We walked twenty yards or so to get some street art for the backdrop, then fired off a few shots with xtarsy kindly assisting with a 110cm gold reflector. It was plain just through the viewfinder that the reflector was lighting up more of her glasses than I thought wise, so we tried a few with her glasses back on her head too. Although those shots are sharper and feel technically better, I went for the imperfectly focused, reflection blurred glasses shot for the main posting nonetheless. It just feels right – she had tonnes of charisma, and it’s better expressed somehow in the first one. I guess I need to throw a polarizer in my kit bag for glasses in the future. 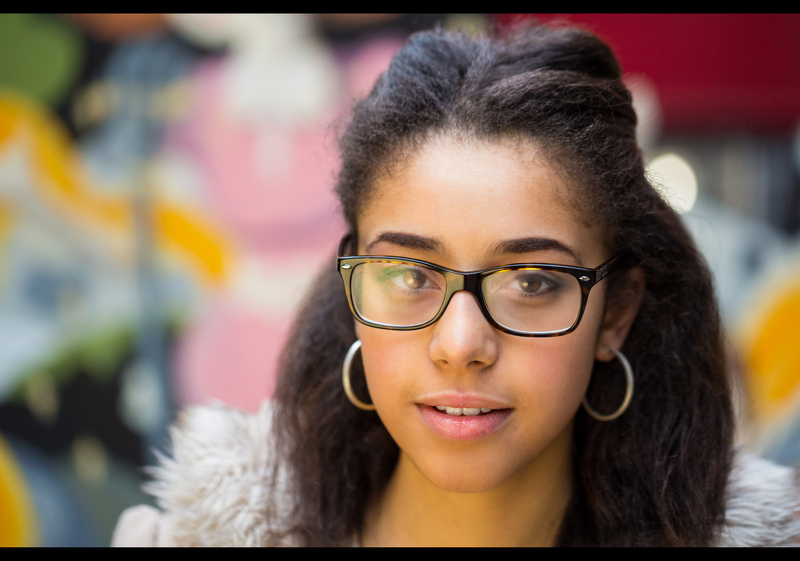 Anymore tips on shooting portraits of subjects with glasses would be welcome! Anyway – once we’d shot, we all had a look at the pictures on the LCD. Stranger and friends all liked the shots and whooped and wowed a lot. Magic! Thank you for being Stranger #9 in my project – and I’d love to hear from you if you wanted to add your name! Sorry I forgot to ask!